You’re probably asking the very same question that I asked; what’s the point of another Kinks Kompilation? There are hundreds (of varying quality) out there already, so why would we need another one? The inner cynic says that it’s the run-up to Christmas and it’s a handy present for older relatives (the ones who still own CD players), but that’s a bit unfair because there is at least a rationale behind this release, and that’s a tie-in with the incredibly successful musical “Sunny Afternoon”, which is still running in the West End (go and see it if you get the chance; it’s great fun). This track listing of the compilation imitates the running order of the stage show until partway through the second disc, where things start to get a little unfocussed. There’s a section of ten songs which have been chosen by Ray Davies to add to the selection, followed by some interview snippets and the obligatory BBC sessions; it’s a bit of a mixed bag really. 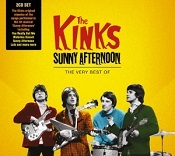 The idea of following the show’s running order demonstrates the development of The Kinks and Ray Davies’ songwriting. The first three songs are completely forgettable sub-Merseybeat, and it’s not until the music hall-influenced “Denmark Street” that the Kinks truly original and particularly English character emerges, starting a run of twenty-five truly great songs any real music fan should have in their collection. The ten songs chosen by Ray Davies come from a variety of sources including the albums “Arthur”, “Kinda Kinks”, “Are the Village Green Preservation Society” and even the soundtrack for the film “Percy”; they cover the period 1965 to 1972 and give an indication of the breadth of Ray Davies’ songwriting and the fact that there’s a lot of very good Kinks material out there that most people haven’t heard. The interview clips are fairly standard innocuous stuff used to introduce BBC recordings of “You Really Got Me”, “Tired of Waiting for You” and the Dave Davies classic, “Death of a Clown”. The overall impression of this package is that someone saw an opportunity to tie in with the stage show but wanted to make it a double CD package without having enough material for two discs. If you don’t own any Kinks albums, this isn’t a bad introduction but it’s a little haphazard once you get past “Lola” on side two. Out now on Sanctuary Records (KINKSTVCD001).